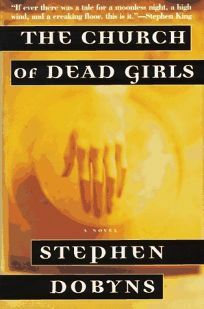 In a gripping prologue to this masterful psychological thriller, Dobyns creates an unforgettable scene: in an attic shrine, the bodies of three dead girls are tied to chairs; all have had their left hands cut off. Aurelius, the town in upstate New York where this bizarre discovery is made, is the kind of place where everyone knows everyone else. As the narrative gains momentum, Dobyns brilliantly chronicles the gradual ripping away of all trust and familiarity within the community. Everyone seems guilty, even the fussy high-school science teacher who relates the events leading up to the disappearances of the three girls. Paramount in everyone's mind is the recent return to Aurelius of Aaron McNeal, a young troublemaker whose mother, Janice, was murdered years earlier. The belated revelation that Janice's left hand had been severed, too, signals that her murderer is still at large. The citizens of Aurelius begin to see each other by the dark light of potential guilt. In a story full of brilliant touches, Dobyns, who writes the Saratoga Mystery series, shows how the support group for the family of the first victim metamorphoses into a vigilante patrol that witch-hunts Aurelius into a state of paranoid terror. In the end, this chiller is about the awful power of fear. When the people of Aurelius go looking for a monster, monsters are all they can see. 60,000 first printing; $75,000 ad/ promo; BOMC, QPB alternates; film rights to HBO; foreign rights sold to Fischer in Germany and Penguin UK. (June) FYI: The publishers are circulating a letter from Stephen King praising the novel and connecting it to one of Dobyns's poems, ""The Town,"" collected in the volume Cemetery Nights.